Red Cinquefoil is a member of the Rose Family. The plant grows to 16 inches in height and has dark green leaves with ridged edges which grow to 2 inches in length in groups of 5 to 7. The plant mainly grows in pine forest areas at elevations between 6000 and 9000 feet. Red Cinquefoil is also called Five-finger. 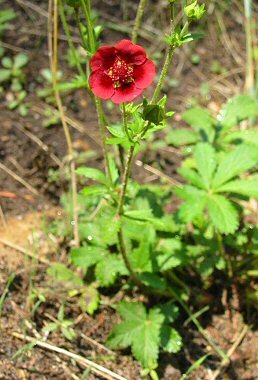 Red Cinquefoil blooms between July and October and produces a dark red flower with 5 petals to 1 inch in width.